Something really ought to be done about the broken Experimental Server Listing page. This page can be found as a sub-fourm link from the Game Servers board. There is no app configured at that hostname. Perhaps the app owner has renamed it, or you mistyped the URL. This page has not worked for nearly a year now, something that has been mentioned in several topics already. If it cannot be easily fixed then it should be temporarily hidden/removed so as to not confuse people until it is fixed. From what I understand the experimental server listing application is running. However the web listing is either not linked correctly (wrong URL?) or broken. I am not sure the experimetnal server list is running. However, the normal list runs on the server, and I think I cannot run both instance on the same server, as they would clashes with ports (I can only run one 80 port per machine and this is a very small VPS). I could run an experimental server lsiting on another port though. Actually, I have not idea how to do that. The server only handles node.js and nothing else, even the DNS lookup is done elsewhere. I could modify the port in the code if necessary, although someone would need to tell me where to find it. I can happily run a second instance on a different port. OR have somebody else run the the nodejs on their server (it is really low effort, low CPU cost). If somebody can tell me where to change the port number in the code (as I am not familiar with the network code), I should be very grateful. It would be good to have the Experimental announce server running again. I'll still look at seeing if a reverse proxy and two listing server instances can fit into 128MB. @prissi - can you post the changes you made to the listing server source mentioned above? One really should use a common listing server but expand it to support multiple distributions. This would likely save resources and hassle in the long run. Too bad people did not think of this when they made the functionality as retrofitting it is likely to be difficult. I can't get the listing server to work at all. First it complains of "dns.validate - failure (valid IPv4 but does not match request IP" which is nonsense. So I'd need a working source to get any further - debugging nodejs crap is not for me. If desired, it could easily go on my secondary server, although if that is desired, we might have to work together to figure out how to make it work. It's not running cPanel - but it is running VirtualMin. But I have zero experience with node.js, except understanding the barest of fundamentals. If it *is* desired, I'll do some googling to see if it works. Is it really necessary to have two list servers? Is distinguishing by version and pakset not enough? Is distinguishing by version and pakset not enough? It is not enough because it does not tell what it is a version or pakset of... Basically the listing server assumes all versioning and paksets are equal, and not of entirely different applications. The pakset and version of standard and experimental might somehow end up overlapping at stages causing problems. experimetnal also uses a different versioning of the main executable, so in principle one would not be able to join "wrong servers". Thus, as long as the announce protocoll (and the other few server bits) are not hacked, both could be on the same server. But I think experimental savegame format is no longer backward compatible. 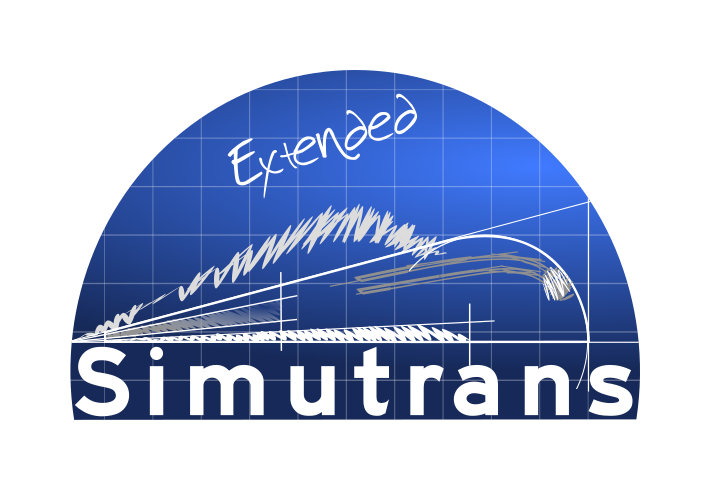 Sadly I am still very busy for the next week; but adding some small support for simultanious support of both is not too difficult. But then, also running node.js and fixing the code was simple. In a twist of irony Heroku actually now has a free tier of their service which lets you run something 24/7 (I had to move the listing server off there originally due to them changing their free offering such that it shut the server down for 6 hours a day, my thanks to Prissi for setting it up elsewhere). (I am not going to do this myself because I don't wish to be responsible for it again). Isaac, would you please install nodejs on server.exp.simutrans.com. I'll try to set up a listing server for experimental. Vladki - thank you; that is very helpful. http://simlist-exp-simulist-exp.44fs.preview.openshiftapps.com/ runs another listingserver. It is hosted free on openshift. SO if Isaac changes the experimental DNS to this one, it should work at the moment. Please let me know when you have updated this so that I know whether and to what to change the URL specified in the code. This should work right now under this URL. But I have no idea how stable it is. Only long term tests will reveals this. Edit: Attempting manually to submit the details using the /announce page, I get a "Bad Request - DNS field invalid" when I insert "bridgewater-brunel.me.uk" into the relevant box, using the correct (default) port number manually typed into the port box. nodejs and npm have been installed. It may need more debugging and fiddeling until it works. The server I set up seems to be behind a proxy, which returns wrong IP address for recieved traffic. Thus any announce will fail. Setting up a dedicated server on Isaac server will be the best way forward indeed. Thank you all for your help so far. You can try yourself. You have to put your IP address in the DNS field. Otherwise you get a "Bad Request - DNS field invalid" error. I have updated the code with the new address. I have added yesterday a more verbose debug on the server. Best is to look at the debug output at the server, if the announce fails. So I have installed a local copy of nodejs -0.10.x from https://nodejs.org/dist/latest-v0.10.x/ and voila, lsiting server is up! Excellent! Three gold stars for you! Is it possible to put the commit # in pakset and game version info? The trouble is that the commit number is fantastically long (unlike the SVN revision number, as, on Github, it is a unique number for the whole of Github, not just for Simutrans-Experimental), and so would be unwieldy to have in a user-readable version number. 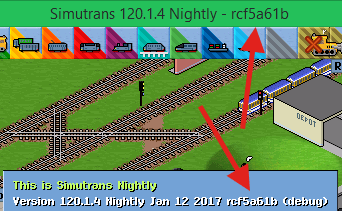 I did look into putting the compile date into the version number, which would work well with a nightly build system, but have not yet found a way of doing this satisfactorily. Would you mind posting this in a separate bug report thread? By the time that I am able to look into this, I shall not remember to look here for bug reports. Edit: Incidentally, having just tested, I cannot reproduce this. Edit 2: The Bridgewater-Brunel server is at November 1909, which is not consistent with it having run on unpaused since it was last restarted. Why don't you do like GitHub and use the first seven characters of the commit number? That could work in theory - but does anyone have any idea how programatically to extract these data so as automatically to form part of the version number? Thank you; that is very helpful. I have changed this in the makefile on devel-new-2, but have yet to try it in practice with WITH_REVISION defined. I did not test, maybe I got the makefile syntax wrong, but the command is correct. I am afraid that this does not seem to work, and I cannot find any alternative way of doing this that does not seem extraordinarily complicated. Also, it is not clear how to make this work equally in Visual Studio as with GCC. Have you (or anyone else) any ideas? although I have yet to have a chance to test this. Edit 2: On testing on the Bridgewater-Brunel server, this still does not appear to work: "REVISION" does not seem to be defined, and so defaults to 12. Maybe because it's a string and the Simutrans code expects int. This has the effect that, if REVISION is not defined, it will be defined as EX_VERSION_MAJOR.EX_VERSION_MINOR. EX_VERSION_MAJOR is currently defined as 12. The number 12 is that which I see. It would therefore appear that the current behaviour is caused both by the code expecting an int and by REVISION not being defined in any event. or rewrite the Simutrans code to accept hex. Integers only, no floating point allowed. Or again rewrite the code. No changes done except for my suggestion, but that's on Linux and with Standard code. For MSVC the makefile has no effect. Also git has to be accessible from the shell, if you open cmd and can't call git you need to add the executable to the variables. And what do you suppose the output of atol("cf5a61b") might be? How about a big fat zero. The window title treats REVISION as a string, no problem. The listing server version check treats it as int32 parsed from the string with atol() - hex not allowed. Hey, I have no idea how the server code works, I just wanted to show that my suggestion does set REVISION correctly and that it prints it while James' build is not setting REVISION. Do you think that the problem is only on the listing server? That simutrans itself is treating the revision as string, and only the listing server is trying to convert it to a number? Thank you all for that. However, I think that I am still missing important contextual information necessary to understand how to make this work, especially in Visual Studio. I did try to use the "revision from file", but that only defined revision as "Unversioned directory" (and appeared to have no logic for doing anything else, which made that seem rather pointless; indeed, I notice that the whole REVISION_FROM_FILE preprocessor directive and related code has now been excised from Standard). I still do not understand why REVISION was not defined even in the Linux builds, however. Any assistance would be much appreciated. Thank you all again for your help so far. indeed, I notice that the whole REVISION_FROM_FILE preprocessor directive and related code has now been excised from Standard). I note the pre build is missing from SumutransEX project, and you defined WITH_REVISION rather than REVISION_FROM_FILE. Is the git executable on your path? From the GIT working directory where you invoke make, just run the git rev-parse manually, and you should see the printout. Did you put WITH_REVISION=1 in config.default? And no other definitions of REVISION sneaking in? You don't need a make variable called REVISION, you need a preprocessor REVISION as was properly done by An_dz. In both cases it will set REVISION with the output of running the command "git rev-parse --short HEAD", which means both will simply run the git executable. TurfIt has already pointed that the JS is not included in Experimental vcxproj, you just need to add that xml part and VS and the JS will do the rest. As git is called you need to have a .git directory inside the working tree and git must also be installed and set on your PATH so you can call it globally. On Linux this should be trivial as installing git from any repository already installs it on the main bin dir. On Windows you'll need to include the path to the git executable into PATH. If you are using the GitHub desktop UI you need to navigate to %LocalAppData%\GitHub\PortableGit_random#\cmd then you can add this folder to you PATH. Thank you both very much - this now seems to work in Visual Studio. I have yet to have time to test it in Linux - I will report back in due course on that. Edit: This also seems to work - in principle at least - in Linux: thank you again both for your help. However, I am not able to make it work properly in Linux due to two other issues, one of which is extremely baffling. The way that I have had the server set up is that I simply created a directory for the game, pulled from Github, compiled Simutrans, did the same for the pakset in a suitable subirectory, and ran it from there. This simple arrangement works well enough in itself, but I need to alter simuconf.tab from the one on Github. This means that, now, whenever I pull from Github, it merges into a new commit and the commit number on the server is therefore not the same as for the release. I had hoped to get around this by using the separate directories that I had set up for the nightly build to build the executable, and instead of having the actual executable in the running directory, just have a symbolic link to the executable in the nightly build directory. This would then be at the default commit number and thus should not cause problems with merging. I have used a similar system successfully for the paksets: the pakset used by the Bridgewater-Brunel server is now the identical one to that offered as the nightly download, just symbolically linked to the relevant directory. However, I have had a bizarre problem in building the server executable from the nightly directory: it refuses to build a command line version even when explicitly instructed to do so in the configuration file. I created a new copy of config.default called config.server, and created a /server subdirectory in the ~/build directory. When I run env CFG=server make -j5, it indeed builds a separate copy of simutrans-experimental in the /server subdirectory, but, when I try to run it with no options, it complains of there being no GUI themes, indicating that this is a graphical build. When I try to run a version built as a command line build, it complains instead about a modal dialogue unless it is given command line switches indicating the pakset and a saved game to load. If anyone has any ideas as to what is wrong, I should be most grateful. Thank you both again very much for your help so far: it is greatly appreciated. I think the revision numbers now work perfectly - I can see the right git short hash in client and server listing. The command "CFG=server make -j5" with your config allows me to build a working command line version on Linux. I can also confirm the reporting of the correct build hash. That is very curious. Have you (or anyone else) any idea why it does not seem to work for me? Could I be missing something obvious? Edit: I tried copying the exact same config.default that I used to build the server version into the nightly directory and naming it as config.server. The only change made was to the output directory of the executable. Even after running "make clean", the executable produced is still one that complains at having no GUI themes when launched instead of complaining about a "modal dialogue" as a non-GUI build would. I am afraid that it is entirely beyond my comprehension how this could be happening. Edit 2: Having checked, the makefiles are identical. Thank you all for maintaining this - it is much appreciated. Incidentally, interesting new icon, Isaac! I'll create the account and send you login information. Does it interact with apache in any way? Because I haven't played with the apache setup yet, but I will if I need to. I do hope it's not a pain to move. Thanks to Google Deep Dream (technically Deep Style for the pic). The listing server does not need apache (or any other http server). However I have used http://server.exp.simutrans.com/ as a place to publish compiled executables and paksets for use with the server games running on the same server. Also I used it to store screenshots and saves for bug hunting. But I can put that stuff elsewhere. That was much faster than I expected. Unfortunately I'm away on Easter weekend. Thank you for setting that up. Can I confirm that you would like me to alter the game's code to point to this new listing server instead of the current one? Also, I notice that the old "Experimental" graphic is still used - could this be changed, I wonder? Do you have some logo with extended text? This one was already available with the code. Please test the new listing server and if it is ok, change the address in code. I hope that this one will stay. However the old address should be redirect to the new one as well. I am afraid that I do not have a logo with the Extended text; it was not I who made the old "Experimental" logo. Is the old listing server address already set to redirect to the new one? If so, the new listing server is not working, as the Bridgewater-Brunel server would be announcing every 15 minutes or so, and would have been redirected by the old server to the new one. Edit: I am a little confused - is the redirection working yet? http://server.exp.simutrans.com:8080/list still has the full listings, but http://list.extended.simutrans.org:8080/list only has what seems to be a spurious test listing. I need to know whether the new server is working before I switch the game code; perhaps an interim redirection would assist in a smooth transition? Dns is in the hands of isaac. I sent him PM that he can change it. I want to work on a squared logo as well so to use as the program icon, but I'll probably finish updating the standard versions. Wooow, thank you very much. Can I check what the latest position is with the DNS? I had to cut away the padding, as it was already padded by the web page layout. You got it right, the padding in the file is to help on images.